He is the true style follower of his Guru the Great Hari Prasadji” …”I feel he will maintain the Indian music style & system to the music lovers…” Anindo Chatterjee. Fabrice De Graef (Indian bamboo bansuri flute and Pc) was born in Paris from a pianist mother and a dad synthesisers conceptor. At 7, he started a duet on the bombard with with grand father, a piper passionated for celtic music. When he discovers the bansuri he approaches Hariprasad Chaurasia. He got granted of an indian government scholarship. He has studied aside with H.P. Chaurasia then L. Subramaniam in India nearly 8 years. 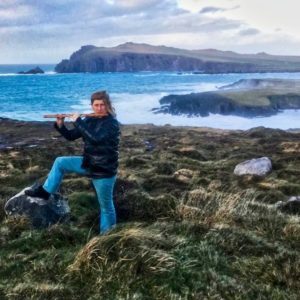 In 2018 he creates an electronic set based on the Bansuri and Indo Celtic music. Played at Ozora, Electric Brixton, Harmonic Fest, Mantra Fest… Played or regularly sharing stage with: Giridhar Udupa, Anindo Chatterjee, Jha Wooble, Roy Wooten Future Man, Martin Youth Glover, Soag Siberil, Didier Malherbes… “…He is the true style follower of his Guru the Great Hari Prasadji” …”I feel he will maintain the indian music style & system to the music lovers…” Anindo Chatterjee.